(Phys.org)—A team of researchers working on the Borexino Collaboration at Gran Sasso National Laboratory in Italy is reporting that they have detected neutrinos emanating from the Earth's mantle. In their paper published in the journal Physical Review D, the team describes the neutrinos that have been detected at their site and how they came to believe that approximately half of them come from inside the Earth, rather than from the crust. Neutrinos are neutrally charged particles that have nearly no mass, making it possible for them to pass though most matter, such as our bodies. Scientists believe they come into existence as part of radioactive decay and have been working on ways to prove their existence physically by capturing them with detectors. At the facility in Italy, researchers have set up a large underground tank filled with 300 metric tons of liquid scintillator—when a neutrino collides with one of its particles, a flash of light is emitted, indicating that a single neutrino has been detected. The team at the site has been monitoring the detector since 2007. In this latest research effort, the team is reporting on what have been named geo-neutrinos, which are neutrinos that come from the Earth, either the crust (many of which are thought to come from man-made nuclear reactors) or the mantle. These particles, the team notes, are actually antimatter versions of neutrinos, and have been recorded before, but the detections were very faint, making it difficult to confirm their source. In this new effort, the team looked at detections occurring over 2056 days, with 5.9 sigma significance. The large amount of data allowed the researchers to measure the ratios between neutrinos that emanated from the crust versus the mantle because for the first time, they were actually able to distinguish between the two. They also believe that most if not all the neutrinos originated in either uranium-238 or thorium-232 and estimate that 53 of the 77 detected geo-neutrinos emanating from the crust, were from man-made sources. The work done by the team is likely to help scientists gain a better understanding of how radioactive decay of material inside the Earth drives other processes, including convection over long periods of time, of rock in the mantle. Dark yellow is what we'd expect to see from our nuclear reactors. The black crosses represent our data. At the low end of the energy spectrum, you see that the data goes up above our reactor neutrino spectrum. So, let's assume that Uranium and Thorium are decaying in the Earth's mantle, and they have spectra light and dark blue. We can scale them up or down, and so we do that until the reactor neutrinos + Uranium and Thorium neutrinos match our data (black crosses) best. This curve is given by the yellow section. It is NOT simply enough to point and say "look, this qualitative thing kinda sorta matches this fringe theory I believe in." 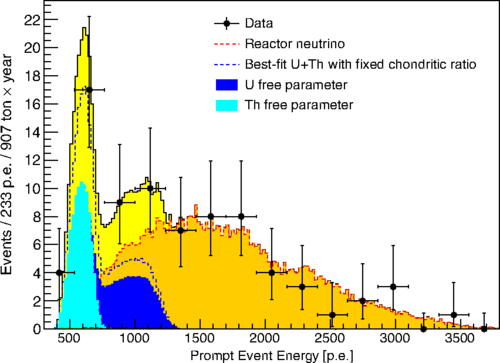 What *specific* rate of neutrino production does your pet theory predict? What's the energy spectrum? Conventional science does assume that there are radioisotopes decaying within the Earth. This seems to be a signal of that effect. Conventional science does *not* assume that this is a "fission reactor" as in a moderated chain reaction, that you seem to be suggesting. What specific evidence would exist (quantitative, not qualitative evidence, at that) that would support the theory? So Shavera, then I take it the cross point is the centroid of a probability for the assumed 'solution' of the Schroedinger wave function. In any case, the plot taken as a whole appears similar to the positive half of a " 'bell curve' like" exponential function in natural logs. The site took away the commenter rating for the articles, and trolls have taken away realistic peer review ratings as well. So we readers have lost twice.
" you cannot never disprove "
Care to translate this string of "negatives" to what you really mean?